I’m Giving It All Away! 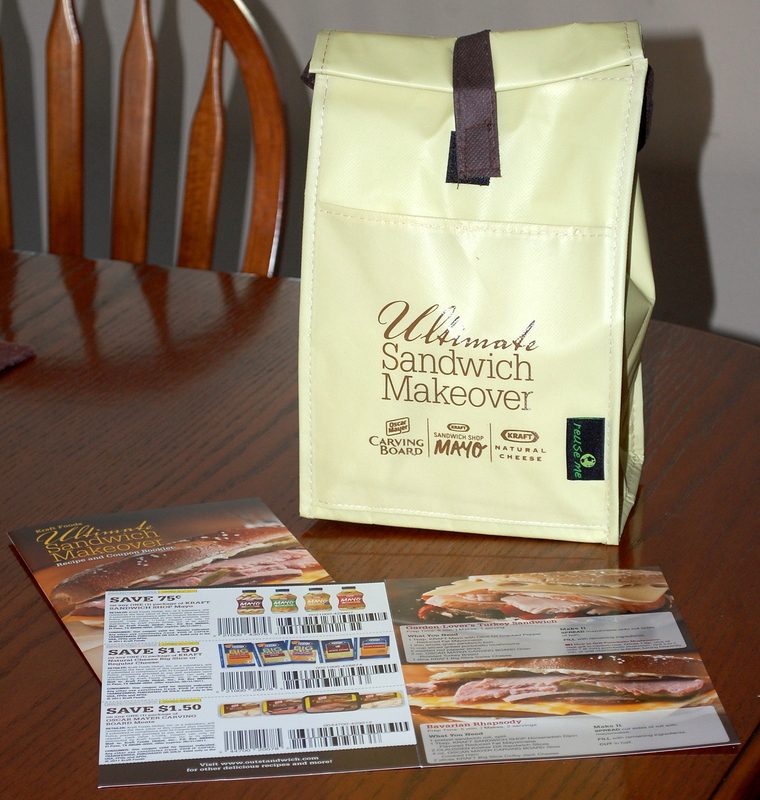 Three people entered the drawing for this wonderful insulated lunch sack, a sandwich recipe booklet, and the $3.75 cents worth of coupons. Two of the coupons ($1.50 All Natural Big Cheese; $1.50 Oven Roasted Carving Board Meats) were worth about 50% of the product’s original purchase price. The third coupon is for 75 cents off a bottle of deli spiced mayonnaise. Good stuffs. 7 grain bread, the Sandwich Shop Hot and Spicy mayo, Kraft pepper jack big cheese slices, Kraft Carving Board roast beef or Kraft Carving Board ham. To all of that I would add field greens, beefsteak tomato, dill sandwich slices and black olive. Open face Peppridge Farm Sandwich Thins, spread with Chipotle Kraft Mayo, then topped with Carving Board turkey. Top the turkey with a juicy slice of tomato, then add a slice of Kraft Pepper Jack cheese THEN….lightly toast to melt the cheese. Yumo. I would chop up some of the ham and scramble it into srambled eggs with chopped onion, tomato, jalapeno and shredded cheddar, pepper jack, and Colby cheeses. Take a whole grain tortilla (warmed) and spread chiplotle mayo and guacamole on the tortilla. Lay the eggs down the center. Top with salsa and a bit more shredded cheese. Roll it up and serve burrito style. If you just finished reading those recipes I know you’re hungry! Don’t you wish you’d have entered the drawing? Well guess what, you can! I have yet another insulated lunch bag and set of coupons to giveaway. Unfortunately, Beth won’t be able to enter this giveaway — that’s because she’s already won this one! — However, Church Lady and Tilden are invited to try again with different sandwich recipes. Be sure to read the rules. Oscar Mayer Carving Board Meats — turkey, chicken, ham, roast beef. Happy sandwich making! Oh, and congrats, Beth! For lunch today I am having one slice of Dave’s Seedy Bread with Sandwich Shop Chipotle Mayo, slices of Oscar Mayer Oven Roasted Cutting Board roast beef, grilled onions and mushrooms, with a Big Slice of all natural Swiss cheese melted on top. Yum! Thank you kindly! I sent you my mailing address. And good luck to the contenders in this go-round! Got it, Beth. Congrats on your win! My sandwich is the Make Your Own (and keep your hands off mine)! I like the Kraft Carving Board Roast Beef, a slice of cheddar, lettuce, tomatoes, and the Horseradish Dijon. Akelamalu — oh, sweet onion relish sounds yummy! I didn’t enter because I probably wouldn’t be using these products and I didn’t want to potentially take them from someone who would. I’m not much of a sandwich eater. Give me a soup giveaway though, and I’m there! Kelley — I prefer soup to sandwiches myself most of the time. I am not much of a bread eater. liberally spread the Sandwich Shop Horseradish and Dijon mayo on the toast. add some Kraft Big Slice pepper Jack and melt under the broiler. add some crisp iceberg lettuce, thin sliced red onion and thin sliced beefsteak tomato. then top with Oscar Mayer Carving Board Ham and the other piece of toast. i’ll call this the Speecy – Spicy Ham Sammich! Tilden — sounds good. When’s lunch!? Dang. Congrats to Beth. I’ll be back when I have time to think about another sandwich. CL — I wish everyone could win! A close replica of this sandwich is my favorite comfort food on a cold snowy day with a bowl of tomato soup. Stacy — this sounds wonderfully yummy! Do you want me to help you eat this, Little Beth Red Hen (I didn’t enter)? Jim — why didn’t you enter? A pretzel roll spread with the horseradish dijon, then topped with the Oscar Myer ham and a slice of Kraft Swiss cheese (toast lightly to melt cheese). This one is simply called the Ham & Cheese Pretzel Roll Melt. CL — oh man does this sound yummy! I love my pretzels and cheese. Ham would really make it pop!